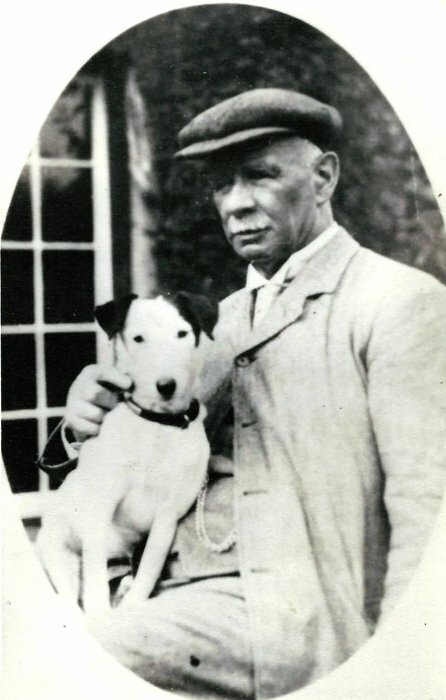 Photograph of Dr Barnes and Spot. He lived at The Elms (now Mulberry Court) and was the first person to have a motor car in Wheatley. It got stuck in the flood at the end of the High Street in 1910. At one time his surgery was at The Crest, 37 High Street, and he kept his gig in the barn at the back in Church Road. He retired in 1925. Miss May & Doris Gale, 60 Church Road. Greystones - formerly known as The Kennels.